Habit: Perennial herb; bulb 4--6 cm, ovoid, deep. Stem: 30--180 cm, generally simple. Leaf: mostly basal (cauline reduced), 20--50 cm, 8--15 mm wide, blue-green; margins wavy, white. Inflorescence: raceme; bracts conspicuous, +- ovate, papery; pedicels +- 1 cm. Flower: jointed to pedicel, 4.5--6 cm, funnel-shaped; perianth parts 6, fused below, petal-like, white with silver-green midstripe especially abaxially, lobes 3--4 cm, +- oblanceolate, spreading; stamens 6, attached to perianth; ovary superior, chambers 3, style slender, stigma +- 3-lobed. Fruit: 12--16 mm, 3-lobed, loculicidal. Seed: +- 5 mm, flat, black. Chromosomes: n=24. 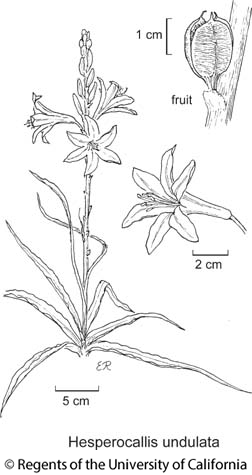 Citation for this treatment: Dale W. McNeal 2012, Hesperocallis undulata, in Jepson Flora Project (eds.) Jepson eFlora, http://ucjeps.berkeley.edu/eflora/eflora_display.php?tid=28026, accessed on April 19, 2019. D (exc DMtns); Markers link to CCH specimen records. Yellow markers indicate records that may provide evidence for eFlora range revision or may have georeferencing or identification issues. Purple markers indicate specimens collected from a garden, greenhouse, or other non-wild location.